The talented cast of “As the Port Churns” shows off. The show is an improv style soap opera that has two shows scheduled at the Tom Rooney Playhouse on Nov. 19 and 26. 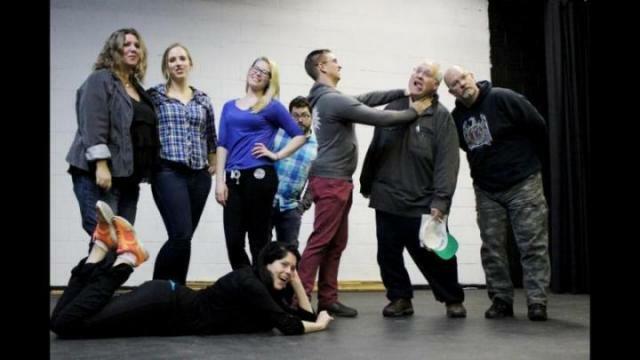 Live theatre is coming to Prince Rupert this month, but with a twist. “As the Port Churns,” an improv-based soap opera, will be sure to entertain at the Tom Rooney Playhouse this weekend that features a spin on Rupert stereotypes. “There are characters that will be thrown into situations, so it’s a little improv-driven, but very strongly based in characters. They’re kind of local stereotypes and just oddballs,” said writer and director David Smook. The actors are both experienced and new to the stage.The group will only have three rehearsals, so it’s a fast and furious preparation before opening night. The show has two episodes scheduled with one on Nov. 19 and 26. For both dates the doors open at 8 p.m. But depending on how things go, Smook plans for the show to go on. “It’s a continuing saga and there will be story lines that carry on. We’re going to try to cast new people too. In the new season, we’ll have casting auditions,” he said. As part of those auditions in the new year, one new person will be cast every week to join the show. “Audiences can expect a jolly good time every night,” Smook said. Based on the actors’ first rehearsal last Thursday, it’s sure to be entertainment you don’t want to miss. The inspiration to revive this idea came after Lyle McNish went to the Fringe Festival in Edmonton and was inspired. Smook is working with McNish to produce a revival of this soap opera. Harbour Theatre hasn’t put a show on like this in 15 years. Tickets are $12 and can be purchased at Homework or at the door.